Explore, imagine, and more at the best hands-on discovery spot in Charlottesville for families with newborns to children age 8! The Virginia Discovery Museum is the city’s only nonprofit children’s museum and welcomes more than 55,000 visitors each year. For more than 25 years, VDM has provided enrichment opportunities in literacy, science, math, and the arts through interactive exhibits, exploratory and imaginative play environments, and educational programs. The Museum also hosts several annual community events, including our Kid*Vention science fair in February and our Discovery Dash children’s track race in May. Sundays & Evenings: Available for birthday parties and event rentals. Have a specific question? Click below to find out how to direct your inquiry. Pay once and enjoy all-day admission! Visitors may come and go from VDM as much as they please until the Museum closes at 5:00 p.m., and your receipt is your ticket for re-entry. Children must be accompanied by an adult at all times, and visitors must have one adult for every three children under 3 and one adult for every five children 3 and older. Visiting the Museum with a school class or other formally organized community group? Reservations are required for large groups, so check out our Group Visits page for more information about booking a trip. Click the icon in the upper left corner for map legend and details. As of Oct. 1, 2017, VDM validates parking for Museum visitors at the Market Street Garage only. The garage provides visitors with their first hour of parking for free, and Museum guests receive an additional hour of free parking – for a total of two hours – when they ask for a validation ticket at VDM’s Front Desk. 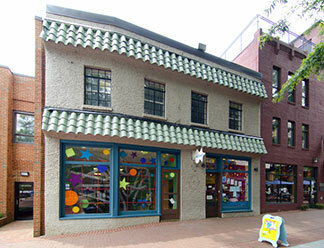 The Market Street Garage is conveniently located across from the Museum along Charlottesville’s downtown pedestrian mall. From the garage, take the Main Street elevator to the ground level; VDM is across the bricks to the left, next to our antique carousel. Public Transportation: The Museum is also located next to the Downtown Transit Station and Visitors Center, and Charlottesville Area Transit offers a Free Trolley that stops at the station as it travels through Downtown and the University of Virginia. Learn more about CAT’s routes and fares at charlottesville.org. 1) Children must be with an adult at all times. 2) Visitors must have one adult for every three children under 3 and one adult for every five children 3 and older. 3) No food, drinks (except water bottles), or gum in the Galleries. 4) Walk; do not run. 5) Treat visitors and exhibits with respect.